What Do Our Kids Eat? 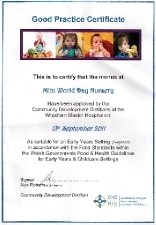 At Mini World we provide all our children with breakfast and a hot two course lunch all included in the fees. Our meals our prepared by our qualified resident cook. Children will also be provided with a choice of healthy snacks and drinks mid-morning and mid-afternoon with a light tea. We will also undertake to provide a vegetarian or other special diet in consultation with parents. We like to promote healthy eating at Mini World and our menu''s include fresh vegetables, fruit and meat. We try to create a home from home atmosphere and children in pre school love having their own little jobs to help friends, from giving them soap to wash hands to setting the table with placemats, cutlery and drinks, this gives them a sense of belonging as well as feeling part of the group and developing self esteem. At Mini World we try to encourage children to try different things so use interests to do this. We have had Gruffalo smoothies, Rudolph pizzas, dinosaur lunch (salads), and Handas fruit salad which the children loved being involved in helping to make. We currently have a 5 rating food award from the welsh food standard agency. We encourage our children to drink water and milk . water is available at anytime and milk is provided by cool milk scheme daily. We are also a ''Stop the Rot'' registered nursery campaigning for good dental practice and healthy choice eating. Our children regularly brush their teeth after lunch using own tooth brushes and tooth taste.